Having noticed that you have some orphan children and other class of people you want rid of from your Workhouse, I thought it a likely place to get a wife. I am a respectable working man under 40 years of age, a widower with no encumbrance, a good set-up house, a coal-hewer by trade, and wants a wife, as I am completely sickened of housekeepers, having had no less than 18 in as many months. If you can fit me up with a respectable lassy between 30 and 50 I would be glad, and would be glad to take an orphan girl into the bargain free of charge. I prefer a single woman before a widow, as widows won’t do for me. I have no particular fancy for beauty; a plain girl will do for me, only she must be clean and industrious. If you have one please let me know and I will come with a trap and take her away free of charge to the Guardians. Let me know soon, please. The reading of this letter caused much amusement, and Mr. Leonard (Crook), moved that a committee of bachelors be appointed to consider the matter, but this was not seconded. Mr. Todd said they should try to accommodate the man (Laughter). The Chairman: I cannot answer that question. Mr. Leonard: Let him come and have a look round the Workhouse and see if he can find a woman suitable (Laughter). The letter was ordered to be handed over to the Workhouse Master. With its lofty social connections, Bishop Auckland and environs is blessed with many historical highlights and curiosities. 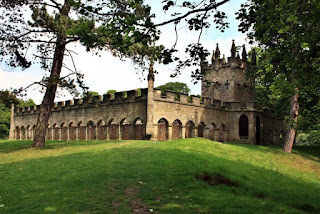 One such item is the extraordinary Auckland Castle Deer House a little to the north of the town. Bishop Auckland is, of course, the home town of the bishops of Durham. And in case you have ever wondered why these guys chose to live here instead of Durham City, well, you need look no further than Auckland Park – a magnificence expanse, purpose-built for hunting more than 800 years ago. It provided a means by which the famous Prince Bishops could entertain both themselves and their guests, as well as giving them an income by various means and a handy supply of timber, etc. Included among the sumptuous mix of bits and pieces that adorns the park is the extravagant Deer House – built during Bishop Richard Trevor’s tenure in 1760 in the Gothic Revival style. It existed to provide shelter for the deer, and doubled as the animals’ dining area, too. The complex also had a resting/viewing area for the bishop and his guests, and the whole construction was built to impress, doubling as a sort of landscape folly for aesthetic purposes. It is essentially a courtyard surrounded by an arcade, with a gateway on one side and a tower on the other. It is clear that these Prince Bishop chaps had far too much money, though the resulting extravagance that is Auckland Castle Deer House is a particularly fine – and, indeed, rare – example of its kind in the UK. In the squabbling following King Henry I’s death in 1135, the Scots, under King David I, used the dispute as an excuse to lay claim to vast tracts of Northern England. To cut a long story short, they were largely successful, being granted most of what lay north of the Tyne, including Newcastle. And, though they weren’t actually presented with County Durham, they hoped to exert severe pressure over the Prince Bishops, too. Scottish rule didn’t last, of course. It spanned what must have been eighteen bizarre years during 1139-57, before King Henry II brought Northumberland and Cumberland back under English rule for good. In County Durham, though, the period was one of confusion. Scotland’s Chancellor at the time was one William Cumin. And when the Bishop of Durham, Geoffrey Rufus, died in 1141, King David tried to insert Cumin as his successor. The process was only ever half-completed, with Cumin never actually being consecrated – and so began a three year battle for the bishopric. Cumin had some supporters, but plenty of opponents too, and the dispute was heated to say the least. Accounts of Cumin’s ‘rule’ are pretty severe, as his troops terrorised the city of Durham and beyond. In 1142, King David threw the towel in and abandoned Cumin, but the usurper battled on by producing a forged letter of support for his cause from the papacy. Word was then squeezed out to the pope of Cumin’s shenanigans and he was excommunicated in 1143 – but the fuss carried on unabated. Historian Simeon of Durham tells us of Cumin’s men incessantly making forages; whatever they could lay their hands on they plundered... wherever these men passed it became a wilderness. Their torments were of many and various kinds, difficult to describe and difficult to believe. Men were hung from the walls of their own howses... others... plunged into the bed of the river... everywhere throughout the town there were groans and various kinds of deaths. 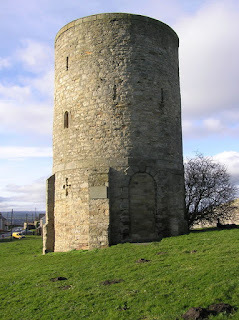 The conflict came to a head at the village of Kirk Merrington in 1144, where Cumin’s unholy band of men holed themselves up in the church and, taking advantage of its slightly elevated position, fortified the site – principally by the digging of a ditch around the building. However, it was to no avail, and the ‘enemy’ overwhelmed them without too much fuss. He must have been quite a talker, though, as he managed to negotiate his way out of immediate danger by relinquishing his claim to Durham in return for lands to endow his nephew, Richard. He did spend some time in jail, but eventually found himself restored to prominence of a sort as Archdeacon of Worcester in 1157 – a post he had held thirty years earlier. And the same year in which, coincidentally, the northern counties were taken back by the English. Nothing remains of the ditch at Kirk Merrington these days. In fact, very little of the original church remains, either, having been almost completely rebuilt in 1850-51. The Australian Hotel – a pub with one of the most ‘out-of-place’ names in the North-East. It was established by local man William Walton on his return from an expedition to the Australian Goldfields in Victorian times. Apparently, he made his fortune out there (equating to around half a million pounds in today’s money), and set about spending it in the village. The story goes, though, that he wasted his money – drinking a good deal of it away – and died with next to nothing to his name. The title of the pub, however, stuck. Hill 60 – a local pit heap from the coalmining era, named thus by soldiers returning from World War I. It was the fashion to name low-lying hills on the battlefields of northern France and Belgium (over which armies fought) according to their height above sea level. So, somewhere in northern Europe lies the original ‘Hill 60 (metres)’! The Wurlitzer Organ – rescued from a theatre/cinema in Bradford by local enthusiasts and rehoused in the village’s New Victoria Centre (formerly the Trinity Methodist Chapel). Only a handful of these were ever made – and it is still occasionally put to use today. Thomas Wright was born in the little village of Byers Green, near Spennymoor, in 1711. He disappeared for the duration of his working, adult life, before returning to the area in his retirement, where he set about building the still-existing Westerton Tower. He died before it was completed, meaning that his planned observatory became little more than a folly adorning the Durham landscape. Wright had his fingers in a lot of pies. He was schooled in Bishop Auckland, before being apprenticed to a clockmaker in the town. 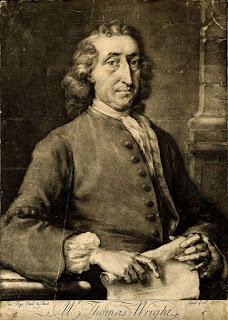 In his working life he began as a teacher of mathematics and navigation at his own school in Sunderland in the 1730s, before moving to London to work for several wealthy patrons. He dabbled in garden design, was a bit of an architect and designed scientific instruments – famously building a huge working model of the solar system (an orrery) for one of his clients. Indeed, Wright is best remembered as an astronomer. Despite what you may have read elsewhere, it was Thomas Wright who first speculated that the Milky Way was most likely a flat disc of stars, and that the blurry blobs of light we see in the night sky (nebulae) are actually distant galaxies. These ideas are often attributed to the brilliant German philosopher, Immanuel Kant, but they first appeared in Wright’s An Original Theory or New Hypothesis of the Universe in 1750. He also helpfully (and correctly) postulated Earth and humankind’s relative insignificance in the ‘grand scheme of things’, and was the first man to coin the phrase ‘galaxy’ to describe a large group of stars. Retirement sent him back to his homeland in Co.Durham, where he set about work on his pretty little observatory (though construction may have begun earlier in his lifetime). His death in 1786 preceded the tower’s completion, so his planned observatory rather unfairly became a mere folly. It has been used, periodically, as a reading room and more recently as council offices. A commemorative plaque was placed there by Durham University in 1950 to celebrate the 200th anniversary of the publication of his famous treatise.